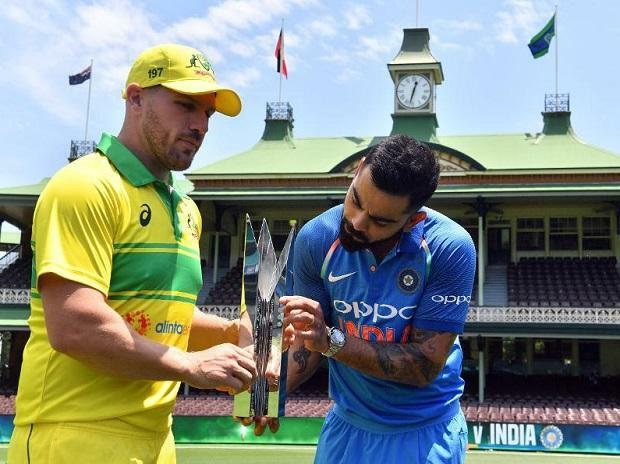 Australian skipper Aaron Finch on Friday said Indian batting is heavily reliant on its top-three and his team will be looking to exploit that weakness in the three-match ODI series beginning here on Saturday. Finch said his side's target will be to dismiss India's top-three batsmen -- Shikhar Dhawan, Rohit Sharma and Virat Kohli -- cheaply. "Over the last 12 months Virat's averaged 133, Shikhar 75, and Rohit 50; so there's a lot of runs and balls faced from their top three. It's important to get them as early as you can because once they get in, they score fast and they don't seem to get out too easily," said Finch on Friday. With the success of the top-order, the middle-order comprising M S Dhoni has not been tested enough. "Dinesh Karthik, Kedar Jadhav, Dhoni these guys that can all play their part as well. The top three are very important but you can't just look at that otherwise there's someone else that will catch you off-guard and get the job done as well," said Finch. "It's just an opportunity to see Alex play in a position he's done quite bit in Big Bash and one-day cricket. He's been shuffled around the order a bit in the last little while... we are trying to search for that process and right balance of the side. "We've got three games here which will be very tough then straight to India for five ODIs then Pakistan so that's a very tough 13 games, then a few warm-up and practice games against New Zealand." "These are still best part of 18 games to get that right. While it would have been great to have a settled side for the last 12-18 months it's still enough time to get it right and make sure come that World Cup that we are ready to go with a really balanced and settled side," he said. "...The two spinners have played a huge role in Kuldeep Yadav and Yuzvendra Chahal over the last month as well. There's no real weak links in their side. They've got an extra spin option in the squad with Jadeja, Kedar who can bowl some off-spin." "They (India) have got left, right-arm, spin, leg-spin, off-spin, so they've got plenty of options... They play their own conditions very well but I think the amount of times they're winning away from home in the shorter formats is a credit to them." "For Siddle to go away and work on the skills that he's brought to the table over the last couple of years in Big Bash cricket is outstanding. He probably went with a real red-ball focus for a long time there and probably neglected the one-day skills. "Then to come back and have an eight-week period last year where he just focused on skills for the white ball and how quickly he improved was unbelievable," Finch added.